Well this was a first. I have never been to a contest micro-site that does not include some sort of request for visitor information and a chance to enter to win the prize. 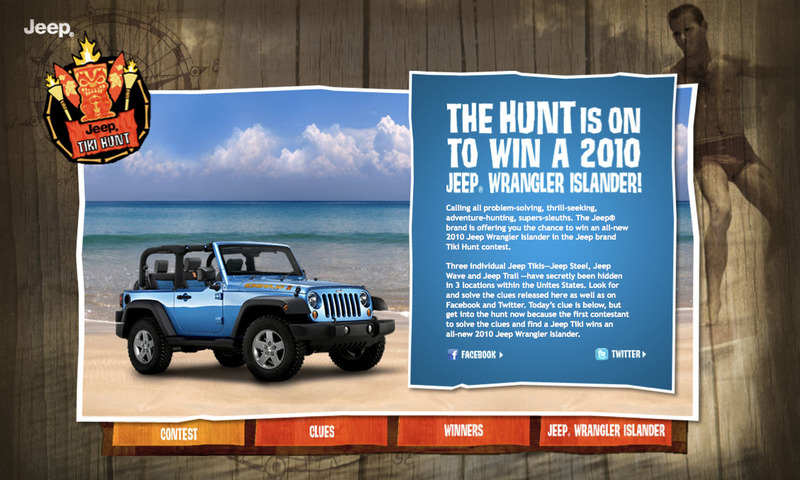 Now Jeep has placed three tiki idols in three locations throughout the U.S. and has several clues on the TikiHunt.com micro-site. There are idols buried in California, Colorado and Illinois. Participants in Los Angeles and Chicago have already won two of the idols. The third and final tiki idol is hidden somewhere in Colorado with two clues left to be uncovered. The one big issue I have with this contest is it severely limits participation, as winners must go to the location to find the hidden tikis. So, if you don’t live in Los Angeles, Chicago or Denver then you really can’t play to win. I suppose you could fly to the location to win but that seems like a long shot and major expense if you don’t get there in time before a local contestant figures it out. Meanwhile, what is in it for the brand since there are no handraisers to add to their database? There is some engagement on the Jeep Facebook and Twitter pages but the engagement doesn’t really lead to much other than some commenting or liking of posts or maybe a retweet on Twitter. 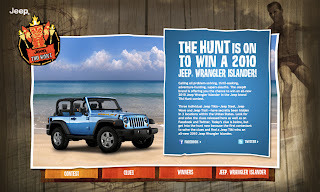 There is a link to learn more about the Jeep Wrangler Islander edition on the micro-site, which brings people either to the vehicle landing page or one can view Jeep Gear. But that’s it. There just isn’t much in the way of leading to key engagement activities like Build & Pricing a Wrangler Islander or doing a Dealer Inventory Search. It just seems there are some missing elements here to make this contest more effective for the company. Also, I would’ve made the hunt more virtual maybe using something like Google Street View and being the first to do a screen capture so that anyone across the country could participate to win, not just people who are physically already in the city.